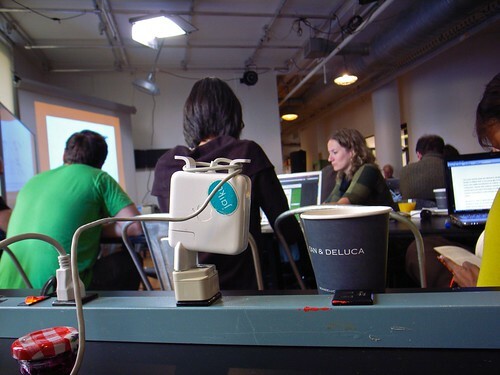 The theme of the 2010 symposium, held at ITP at NYU, was “The city as platform”, which revolved around various sub-topic such as urban informatics, the city as a social technology, pervasive games and government infrastructure/data. Participants included Genevieve Bell, Julian Bleecker, Ben Cerveny, Tom Coates, Anil Dash, Russell Davies, Alexandra Deschamps-Sonsino, Adam Greenfield, Liz Goodman, Usman Haque, Tom Igoe, Natalie Jeremijenko, Steven Johnson, Matt Jones, Jennifer Magnolfi, Mike Migurski, Nicolas Nova, Ray Ozzie, Clay Shirky, Kevin Slavin, Molly Steenson, Linda Stone, Alice Taylor, Anthony Townsend, Duncan Wilson and many more. You can read elaborate and well-written symposium reports by Nicolas Nova (LIFT Lab) and Dan Hill (City of Sound / ARUP). By the way, do also check Dan Hill’s urbanistic take on the iPad.